Perhaps the most popular topic in our book Defying Poverty with Bicycles is setting up a welding shop for manufacturing new bikes. Nearly every leader of a social bike business program who I have spoken with asks about the steps needed for them to set up their own welding shop. Our recommendation to use tungsten inert gas (TIG) welding, the most precise and most expensive welding system, does not bother them. They understand the benefits of using only quality steel. Writing up a budget for welding machines, jigs, and other tools seems easy enough and donors love to contribute to hard costs like this. But for some reason, the concept of a rolling training program sounds too complicated to tackle. “Your clients who sign up for your manufacturing training module are going to be a unique bunch. These are the craftsmen and craftswomen who already love to make things. Some will be easy to spot with handcrafted add-ons to their bikes or you might hear them talk with pride about a clever way they repaired a friend’s refrigerator by fabricating a new part out of junk. These may be your future manufacturing specialists. Don’t let them leave your center without telling them about your next social bike manufacturing course. As I mentioned in Chapter 8, this course must be hands on. 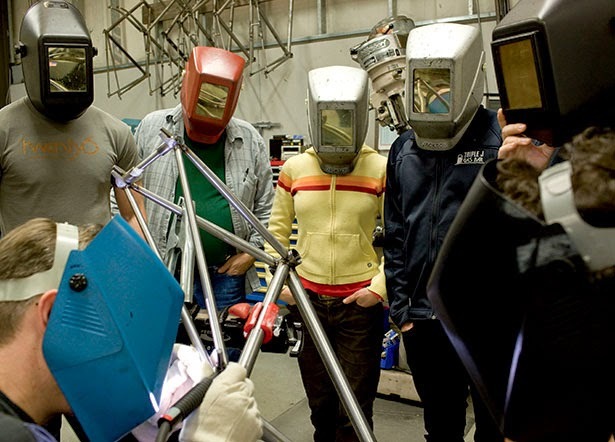 You will include some classroom time to discuss social bike design concepts, the principles of your program, welding concepts and safety, metal preparation prior to welding, and metallurgy, but the training will not begin until they actually strike a spark with a welding torch. All novice welders have to run a lot of welds before their hand, eye and foot coordination settles into a groove. Find a source for new, inexpensive flat steel, cut it into small sections and have your students run weld after weld until they can consistently create perfect welds. If you are not a master welder, you’ll have to hire one in the beginning at least for weld inspections. As your training course progresses, your master frame welders can fill this role. As you can imagine, handling a class of five or ten manufacturing students in this section of the course will be tough. You will need multiple welding machines and stations, or will have to stagger their practice sessions so only a few practice at once. If this is possible, great. Keep them at your center so you or your trainers can supervise their training. Another option is to partner with a local vocational school or community college that offers a welding course. Even if this school does not offer TIG welding or requires students to start with oxyacetylene or stick welding, this practice will transfer to TIG. But they should skip MIG. MIG welding is all about setting up the machine and does not require the skill and coordination of TIG. Once your students can run perfect welds with TIG on flat steel, have them begin practicing on pipe steel. If your local vocational school offers a pipe welding course, definitely include it in your partnership. Bicycle frame welding is pipe welding and pipe welding requires additional skill to keep the proper torch and filler metal angles that result in perfect welds around the entire pipe. Once your students have mastered pipe welding, they are ready to start melting some steel for your program. Have them start by welding the racks for your social bikes. Many of the social bikes designed by our local partners include integrated front and rear racks. These racks must first be fabricated out of small tube steel before they are welded to the bikes. You can also design some of these racks to be sold separately for customer bikes or added to bikes you refurbish. You can purchase this rack steel in long sections at a bulk cost so if a student makes a mistake, there will be minimal loss. The sales of these student-built racks will help cover the costs of the training. By envisioning such a rolling training program, it’s much easier to see how you will find your master welders. The other trainees who don’t make it that far will also benefit and may even find a lower-lever welding job outside of your program because of your training. Have you struggled finding or training welders for your program? Are you eager to start manufacturing bicycles, but intimidated by having to set up such a training program? Please offer your experiences in the comments section.